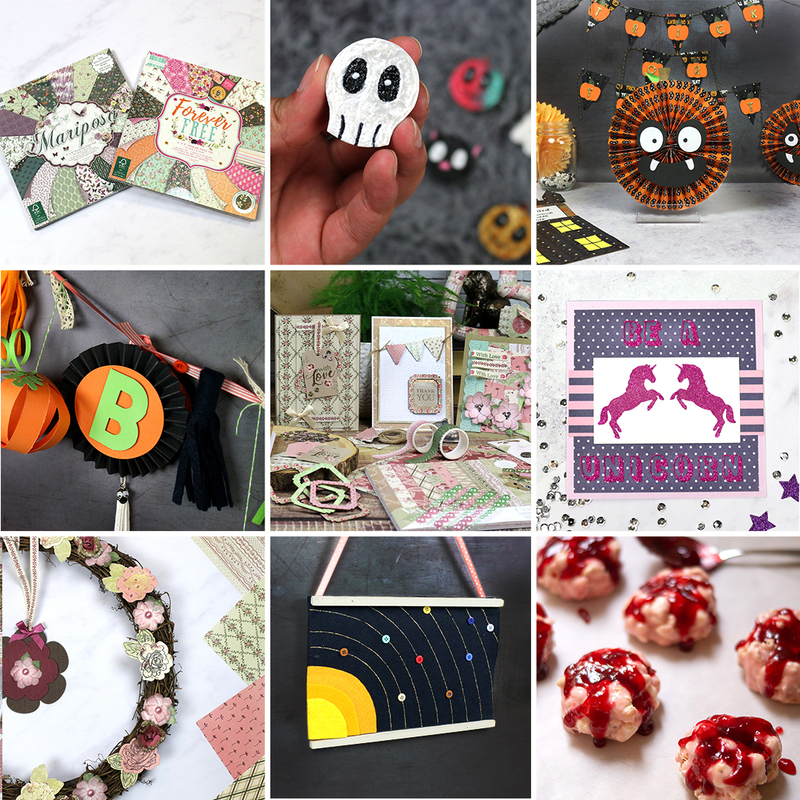 Blog | October 2018 | Trimcraft’s Monthly Craft Summary for September, Plus Monthly Competition Winners! Trimcraft’s Monthly Craft Summary for September, Plus Monthly Competition Winners! Wow! It’s been another amazing month for crafting. We’ve had so many wonderful tutorials on the blog and lots of incredible crafts by you over in our inspiration area. Today, we’re taking you we’re taking you through our Top 9 crafts from September, whether you need to catch up with your crafting or you’re just looking for more inspiration! Keep reading to also find out the winners of our Monthly Competition, Craft of the Month and Project of the Month! As Halloween is coming up soon, we decided to give our papers a spooky spin. Download our designs to find pages adorned with mischievous pumpkins, adorable bats and friendly ghosts sure to help you with your creepy crafting. Our first collaboration with the V&A was so well received that we couldn’t wait to bring out another stunning selection. This exquisite range showcases the rich variety of the V&A’s textile collection with a selection of papers and accessories based on beautiful chintz furnishing fabrics and delicate lace designs. Perfect for beautiful crafts all year round. We can’t get enough of Elle’s Popcorn Monster Brains. They are super easy to make AND delicious – what more could you want?! Plus, they are perfect for the upcoming spooky season, so why not treat yourself! We welcomed autumn in style with Kathy’s fabulous floral wreath created using the new V&A collection. This would be the perfect addition to your home for the cooler months, making a beautiful feature as a hanging on the front door, on the wall or on a picture shelf. Need an indoor activity for the kids during all this rainy weather? We’ve got you covered! Why not try our DIY Felt solar system video tutorial? Your little ones can create their very own out-of-this-world masterpiece, and you can have fun teaching the order of the planets as they do! Have you used our Dot & Dab adhesive sheets in your die cutting? They are great for all sorts of projects but we love them for creating your own DIY Die Cut Stickers. This is especially great if you have something delicate to die cut! Add some spook-tacular décor to your home with Halloween with this ghoulish garland! With a few simple materials, you could have an awesome piece of party décor that will help you to get into the spooky spirit! With Trick or Treat time approaching, why not get your little ones involved and help them to create their own creepy characters? This quick, easy, and spook-tacular DIY project will turn your spare bottle caps into Halloween magnets, perfect for adding a frightastic touch to any magnetic surface! We also launched two brand new paper pads from First Edition. Forever Free and Mariposa are finally here and we couldn’t be more excited to share them with you! With beautiful florals and nature-inspired patterns, there are so many wonderful thing to be created! For this month’s Craft Challenge we asked you to create a Summer Scrapbook Page! There were so many amazing submissions, however this Summer Scrapbook Layout by CathyC72 really stood out for us. Congratulations! Choosing the Project of the Month is always difficult as we always have so many amazing projects to choose from in the Inspiration area! However, the lucky winner is Gingers girl who created this beautiful Bee Happy Folded Card - congratulations! Congrats to all the winners!!! I love so much all these amazing projects!!! Congratulations to everyone who won! Fabulous crafting!!! First of all a big congrats to all the lucky winners here, and next I want to say thanks so much for all these amazing ideas and tutorials for loads of amazing projects. I´ve been a lot away here and haven´t been inhere as often as I use to, so it´s nice to get it all here in one, so I can still see it all and find out, what to try, so thanks for that too.